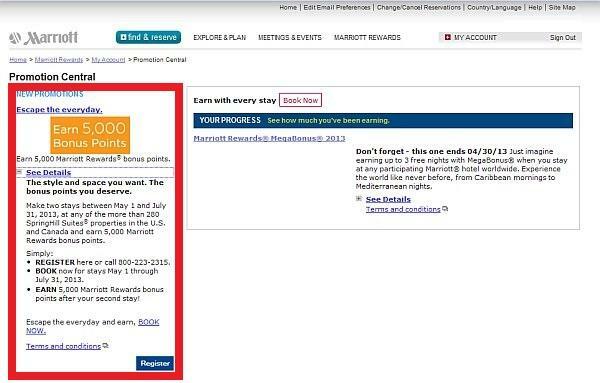 Marriott Rewards has been sending out targeted brand specific offers for 5000 bonus points after two stays at Fairfield Inn & Suites, SpringHill Suites or Courtyard hotels in United States or Canada between May 1 and July 31, 2013. There are separate targeted offers for each of these Marriott brands. You may have received an email about this offer, you may receive a post card from Marriott, or you can just log in to your Marriott Rewards and choose the Promotion Central. Note that you need to register for this offer online or call the number on the communication that you receive. If you were not targeted for this, there is no way to register. This is a nice 5000 bonus points for those that stay at these limited service Marriott brands and have stays coming this summer (and were targeted for it of course). Marriott Rewards® bonus points are awarded to eligible Marriott Rewards members only who register for the promotion between now and July 31, 2013. Member will receive bonus points three weeks after the promotion ends upon completion of two paid stays at any SpringHill Suites by Marriott® hotel in the United States and Canada only, between May 1, 2013 and July 31, 2013. Bonus Points cannot be awarded for stays that occur prior to registration. Members may earn bonus points only one time during the promotion period. A “stay” is defined as consecutive nights spent at the same hotel, regardless of check-in/check-out activity. Visit MarriottRewards.com or call 800-223-2315 for complete offer details.